The 20th-century marked a time when most institutions in the Western world were de-Christianized. A recognition of God, the fear of God, the Scriptures, the centrality of Christ, and almost all remnants of the Christian faith were carefully expunged from schools, children’s media, and children’s literature like The Swiss Family Robinson and Heidi. Others, that were too overtly Christian were simply shelved and by and large forgotten (examples: The Pilgrim’s Progress and The Holy War by John Bunyan). But there are still Christian families and churches living in the English-speaking world and they still want to read good Christian books. The Generations team sees this as a crucial time to re-Christianize our literature, our school curriculum, and our media for the sake of the next generation. To that end, we have re-published original Christian classics with the original Christian content – the content that was stripped from 20th-century publication, as well as some of the “forgotten” Christian classics from the past. We’re calling it The Timeless Christian Stories Series. Here’s what we have re-published so far, with accompanying study guides for 6th, 7th, and 8th-grade levels. In The Holy War, John Bunyan (author of the more widely known The Pilgrim’s Progress) masterfully presents the battle for the town of Mansoul (representing man) as Diabolus (Satan) wages war with Shaddai (God the Father), Emmanuel (Jesus Christ), and the Lord High Secretary (The Holy Spirit). It is an allegorical portrayal of the victory of Christ in saving sinners from the clutches of the devil. 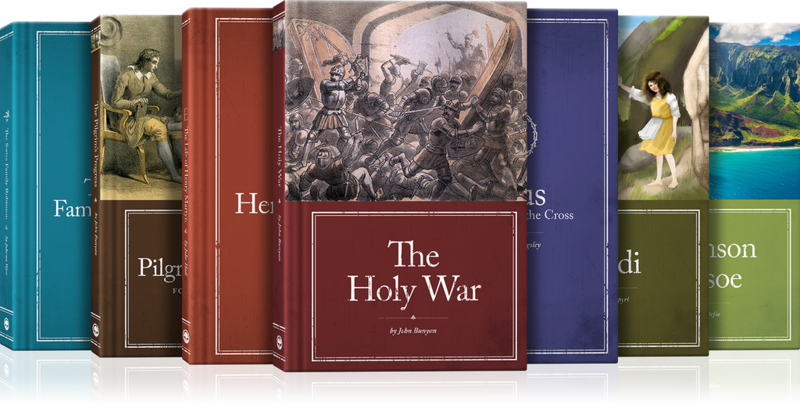 In this classic Christian work, Bunyan’s vivid depictions of battle remind the reader of the reality of spiritual forces warring for the soul. Originally published in 1678, John Bunyan’s The Pilgrim’s Progress remains one of the best-selling books of all time, even though it has fallen out in more modern times. Today, Bunyan’s classic allegory exists in over 200 languages—a testimony to its enduring value to the church of Jesus Christ. 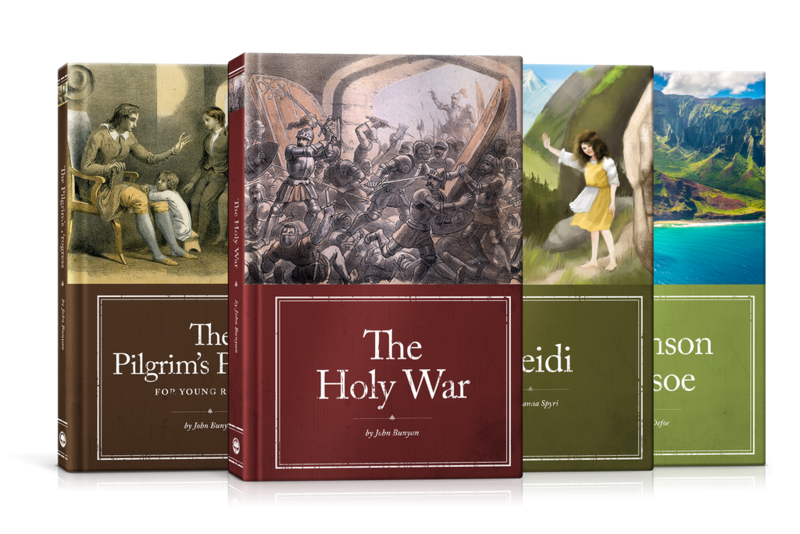 In this new edition of Bunyan’s classic work, Generations has produced a simplified version of The Pilgrim’s Progress (Part 1) for young readers (ages 11-14). This beautiful edition provides a readable introduction to the writings of John Bunyan. Heidi is one of the most popular children’s books ever published, second only to Pinocchio—with over 50 million copies in print around the world (in at least 50 languages). This is a book filled with joy, gratefulness, and praise to God. It is an ideal story for the Christian family, complete with vivid descriptions of sin, rebellion, God’s mercy, forgiveness, reconciliation, and faith. Over the years, much of the Christian content was removed from modern English editions of Heidi. The goal of this landmark republication was to restore all of the original Christian content, some of which was restored from the original German edition of 1881. As a young man, Robinson Crusoe dishonors his parents by running away to sea. He is enslaved in Africa, but manages to escape to Brazil. After years of sinful living, a storm destroys the slave ship on which he is sailing. He is the only survivor. Washed up on a tropical island, he lives there all by himself for almost thirty years. While he learns to provide for his material needs, he is still a slave to sin. Then in the midst of a terrible sickness, he finds forgiveness, redemption, and deliverance in the Lord Jesus Christ. Originally published in 1832 by the American Sunday School Union, this is a short biography of one of the most important missionaries of the 19th century. It was written to encourage young people to dedicate their lives to the sacred work of serving the Lord Jesus Christ. Henry Martyn willingly gave up his life for the cause of Christ’s Gospel in faraway lands. He spent years in India sharing the Gospel with the people of that land, caring for the poor, and translating the Scriptures into the common tongue. Following a raging storm in the Pacific, a Swiss family is shipwrecked on a deserted island. Together, they labor to build a new Switzerland in a faraway place. This new edition of The Swiss Family Robinson is revised from the popular W.H. Kingston translation. This new edition includes many parts of Wyss’ original narrative that have often been removed from other editions. Wyss, as a pastor and a father, originally wrote this story to teach his boys the truths of the Christian faith. In 1894, a publisher held a writing competition to obtain the best manuscript that would strengthen a child’s faith in Christ and love for Christ. Titus: A Comrade of the Cross was the result. This fictional recounting of the life of Christ was so popular that, after six weeks, another 200,000 copies were produced by the publisher. Titus powerfully shows the love, mercy, and compassion of Jesus for sinners. In this story, you will find sadness and sorrow, but you will also find the power of Jesus at work to “heal the brokenhearted, to proclaim liberty to the captives, and the opening of the prison to those who are bound” (Isaiah 61:1). Order Our Newest 4 Books! Order the Curriculum for 35% Off! Do you have suggestions for other Christian classics we should consider publishing? Share your ideas below and we’ll have the resource development team take a look!